Over the years, Chef Shuji has taught innumerable students the secrets of Japanese cuisine in countless workshops, classes and cultural outings. As you will learn from reading the reviews below, each experience has proven to be unique, enriching and memorable. Moreover, students leave the cooking classes with knowledge and skills they can apply in their own kitchens, as well as with a deeper understanding of the cultural roots upon which Japanese cuisine has been built. "Shuji is a fantastic chef and teacher. He combines a warm and welcoming personality with great patience and understanding. We thoroughly enjoyed our two days at Shuji's cooking school with our 10 and 14 year old daughters, and he was really good with the kids. It also helped that he is fluent in English. Shuji tailored a range of suitable dishes for us to learn in the short time available, and also supplied us the recipes. Highlights included delicious seafood, seasonal Japanese vegetables, crispy tempura, and making Udon noodles. Shuji's wonderful mother also helped out, and this gave the whole experience a family feel and really a great insight into Japanese life - we felt very honoured to be allowed this unique glimpse 'behind the scenes' and will treasure the experience. Thank you Shuji San!" Professor Emily Banks (Australian National University) and her family visited Chef Shuji's kitchen on 18-19th April 2016. Many Westerners associate Japanese cooking with sushi and teppanyaki, but there is a whole tradition of Zen cooking that is virtually unknown in the West. Zen cooking is completely vegetarian and utilizes only the freshest ingredients. If there is one man who knows about this style of cooking it is Ozeki Sensei. Not content with being an internationally renowned Aikido master, Ozeki Sensei is also a phenomenal chef with a deep passion for rural Japanese cuisine. During an evening at his restaurant in Seki, that passion shone through in everything he did in the kitchen. Ozeki Sensei started the evening by telling us about the dishes we were going to make. Then we all got stuck in—chopping, grinding and stirring the dishes he planned to serve us later that night. During this process, Ozeki Sensei talked us through each dish. He told us where all of the ingredients came from and described their nutritional value. It was absolutely fascinating to listen to a top chef talk about his trade. And it was just as interesting to see Ozeki Sensei and his mother—who is also a great cook—go about their business in the kitchen. The precision and delicacy that they exhibited in preparing the food was something to behold. At the end of the evening we all sat down to enjoy the dishes that Ozeki Sensei had prepared for us. Each of the dishes was delicious and it was a fitting end to a special occasion. If you are interested in learning more about Japanese cooking, I strongly urge you to spend an evening at Ozeki Sensei's restaurant. "Great cooking starts with good water"
Shuji Ozeki told me. Most chefs might say that good food begins with good ingredients. And they'd be right. As Shuji explains, you first need good water to grow those ingredients. That's the perspective of a man who grew up in Gifu. Shuji invited me to a small cabin in the Hirugano Highlands to try his cooking. Hirugano is the top of Gifu, in the center of Japan, and all the water from Hirugano flows either to the Sea of Japan or to the Pacific Ocean. We were near Gujo, a place that's famous for it's clean, delicious water. When rain and snow fall on the highland of Gifu, it is filtered through layers of leaves and clean soil before it reaches the crystal clear rivers and farms below. On this day, Shuji prepared duck nabe, made from a mixture of fresh mushrooms, locally grown Chinese cabbage, and miso paste made in Gujo. He even made little maple leaves out of carrots to celebrate the autumn season. 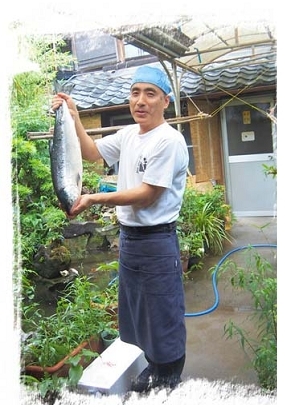 Shuji works hard as a soba chef at Yamakyu, and he gives cooking classes in English to any foreigners who live nearby. Shuji showed me how to make dashi, a broth with kelp and bonito flakes. Then we sat next to a fire and swished slices of duck through the broth. It tasted as good as it looked. home town of Seki, Japan. As well as being an Aikido teacher, Shuji is also a professional chef specialising in traditional Japanese cooking and noodle-making. What makes him stand out are two very important things. First is his fluency in English. This allows him to offer specialized Japanese cooking classes (and Aikido!) in both Japanese and English; a very rare skill to have in Japan and especially useful to tourists who want to experience all the delights of Seki. Secondly, Shuji has managed to integrate his knowledge of Aikido and Zen philosophy into his cooking to produce what can only be described as Aiki-Cuisine. All of his recipes are based on healthy, sensible eating—using only the freshest organic materials. After eating Shuji’s cooking you actually walk away feeling healthier! Our main purpose in Japan was to participate in an intensive Aikido seminar in Nagoya but we were now sitting inside Shuji’s Yamakyu restaurant after a grueling four days of being thrown around in very humid conditions. Since we were running a little late Shuji’s mother kindly prepared a traditional Japanese picnic box (obento) for us to take on out cormorant fishing boat cruise on the Nagara river which started at 6pm. This is a popular thing to do in Seki, even for the locals, where you catch a boat just on dusk, and sit back and watch the spectacle of the local cormorant fishermen displaying their skills as you enjoy a cold beer and feast on some delicious local food prepared by Mrs. Ozeki. Even the locals looked envious of our banquet of fresh garden salad with smoked salmon, nori-wrapped seasoned rice parcels, fresh soya beans and BBQ Japanese sausage washed down with a local brew and a glass of chilled Australian white. For any visitors to Seki this is a must—especially if you can get Mrs. Ozeki to prepare a picnic for you as well! Of course it goes without saying that you can’t visit Seki without visiting the sword museum, preferably on the first Sunday of the month when you can watch a demonstration of authentic sword-making. We returned to Yamakyu by foot visiting numerous small stores scattered down the two main streets of Seki. A traditional sake shop on the way also solved some last minute shopping that I need to do! Arriving back at Yamakyu just before lunch, Shuji suggested that we might like to have a quick shodo (calligraphy) lesson from his relative Niwa Sensei who lived a few doors down. This is another wonderful thing about Seki, all the Japanese traditions that Westerners want to experience are all there in one place—traditional cuisine, martial arts, sword-smiths, calligraphy, tea ceremony, ukai fishing, and ikebana—you name it, Seki’s got it! If you are considering visiting Japan and would like have an authentic and holistic experience; deepen cultural knowledge, learn new skills, eat exquisite food, then Seki, Japan should definitely be high on you list. While living in Japan for a year, I developed a strong interest in Japanese food; unfortunately it was too expensive to eat out all the time and I was unable to find cookbooks in English that would help me to properly cook genuine Japanese food. Luckily, I became aware of the Ozeki Cooking School. As this school was taught in English by a Japanese chef, Shuji, it enabled me to understand how Japanese chefs prepared food and then the pay off: enjoying a delicious meal at the end of the lesson! Throughout the class, Shuji explained what we would be cooking and provided interesting information about where the ingredients came from and the history of certain dishes. All of the students were involved in preparing each dish every step of the way and we were given constant guidance from our teacher. At the end of each lesson we would share the meal together and Shuji would explain more about different aspects of Japanese cooking and we would decide on what would be the theme of the next class. Shuji was always very responsive to our suggestions for classes and would make an effort to accommodate any class members with special needs, such as vegetarians and those who disliked or particularly liked certain foods. I very much enjoyed my time learning to cook Japanese food at the Ozeki Cooking School. I found that my Japanese cooking abilities have increased markedly and I also made many new friends while being involved in these cooking classes. When I see Shuji Ozeki, about once a year, he is normally wearing a hakama and a large grin as he throws students around the dojo, teaching us the finer points of Aikido Kokikai, a martial art that he brought to Australia twenty years ago. He is only a small man, but powerful, and with a big heart! And it is with this same generous spirit that he approaches teaching international students the intricacies of Japanese cuisine. For not only is Shuji a master of Aikido Kokikai, but also a master chef, having run a family owned soba noodle & Japanese restaurant in his home town of Seki for many years. So I finally made a trip to Seki, Gifu prefecture in December 2008. It was only for a day, but I had a blast! Shuji gave me some very helpful instructions about how to get to Seki (the Highway Express Bus from Nagoya took me almost straight to his door-step) and he was there in person to greet me! Shuji buys grass-fed pork at a local family-owned butcher from whom the Ozekis have been buying quality meat for 101 years. I spent the first part of the day with Shuji visiting local suppliers of fresh produce for the ingredients. I felt very privileged to get a first-hand glimpse of life in a modern Japanese country town, steeped in history and local customs. I can assure students of Shuji Ozeki’s that the ingredients he uses are authentic and fresh, right from his home town of Seki, from shopkeepers who all seems to know him! That evening, we drove to the mountains with a boot-load of fish, meat, vegetables, rice and cooking pots. A short drive later, we set about making ourselves at home in a mountain cabin, on a chilly December night, with a fire crackling and the sounds of a clear mountain stream running just outside the window. Shuji put us all to work very quickly. If we weren’t in charge of stoking the fire, or looking after people’s wine glasses, we were to cut vegetables, stir the pot or arrange the table. We prepared a main dish of nabe (traditional hot-pot) to be enjoyed Japanese-style straight from a clay pot heated over a small fire at the table. The dashi stock for this was made from dried bonito (fish flakes) and konbu (dried kelp) from Hokkaido. Using clear spring water, this produced a fine broth in which other ingredients would be cooked at the table. We had thinly sliced marbled wagyu beef, mino pork, cod, fresh oysters, shiitake, shimeji, maitake mushrooms and winter vegetables. Shuji showed us the correct methods to wash rice, slice fish and prepare the broth. He gave us an insight into his own theories on Japanese food—one that is water-based (fresh and light) as opposed to some other forms of Asian food which may be oil-based and completely different. We were given a copy of the recipe that we were helping to prepare, complete with many finer details of the ingredients, and the theories behind each step. I believe that actually taking part in the preparation and the cooking, and listening to Shuji share his extensive knowledge, in such an authentic setting, was an invaluable experience and one that I would recommend to anyone interested in learning some Japanese cooking. The meal we prepared was fresh, light and tasty and greatly enjoyed by all, with much conversation (in Japanese and in English). I can’t wait to make another trip to Seki and to take another class with Shuji.